BookKeeper helps non-profit organizations keep track of their received contributions by generating detailed reports and providing statements to contributors for tax purposes. It also assists with building pledge campaigns by offering a way to record commitments & building fund contributions, as well as generating reports and providing letters to contributors with up-to-date pledge balances. 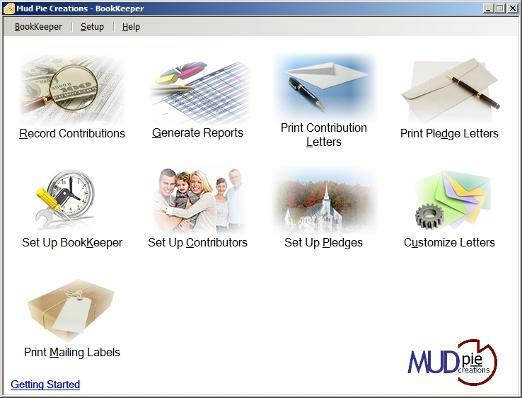 BookKeeper 3.0 records your organization's received contributions! 128 MB of RAM, 500 MB Hard drive space, SVGA with 32-bit color,Printer. ...... commitments and building fund contributions. Plus, you can generate detailed reports and letters to contributors with up-to-date pledge balances. Qweas is providing links to BookKeeper 3.0 as a courtesy, and makes no representations regarding BookKeeper or any other applications or any information related thereto. Any questions, complaints or claims regarding this application BookKeeper 3.0 must be directed to the appropriate software vendor. You may click the publisher link of BookKeeper on the top of this page to get more details about the vendor.